Blog THE NAME OF THE GAME is HYDRATION! For years, you have heard your doctor probably tell you that you need to drink more water. Your body is made up of about 60% water and throughout the day you are constantly losing water from skin evaporation, moisture in your breath, urine, and stool. To maintain proper health, these losses must be replaced daily. The benefits of drinking water are too many to even begin to list here, but suffice to say that it plays a role in almost everything that is going on inside your body. When you are depleted of water, your brain sends out a thirst signal and right now, you can grab a bottle of water and simply chug it down to satisfy that thirst. However, that is simply not possible after weight loss surgery and so relying on the old way of doing things won’t work anymore. Remember, this is a complete life change, so all those habits must change as well. Dehydration after weight loss surgery is one of the most common reasons for hospital readmissions, and so it is essential that we change the way we hydrate after surgery and avoid these issues. 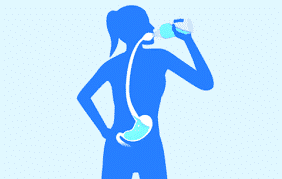 Your goal should be to drink 64 – 70 ounces of fluids each day. While this may not be backed by legit scientific data, it is a very good guideline that has worked for decades. However, we know that with a new, smaller stomach from any bariatric surgery, reaching this goal can sometimes be difficult at first. Remember to take small sips and not drink quickly. Your new stomach cannot hold the same volume as it did before surgery. • Set a timer to remind you to drink – there are phone apps designed for this purpose. There are also multiple water bottles designed with internal reminders or accessories you can add to your own water bottle to remind you to drink throughout the day. Some glow, others blink and some beep. Find what works best for you. Keep a log to track your fluid intake – some of the apps or water bottles mentioned above will do this for you. Freeze liquids or protein shakes, so that as it melts you can drink it cold throughout the day. Add some flavors – Crystal light, Mio, Stur are just a few of the many brands out there that you can add for some fun flavoring in the water, without any added calories. Know the Signs of Dehydration and when to call your Doctor.